While out in Dubai this year we found ourselves eating an array of great food and it got me thinking about starting to post a few restaurant reviews on here. Food is something I love and good food is even better! 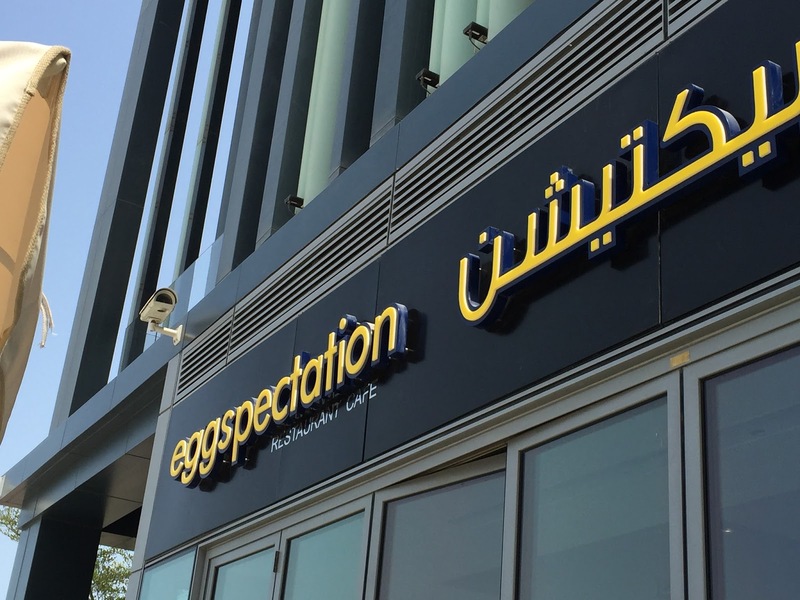 The first place I thought I would review is Eggspectation at The Beach, JBR, Dubai (head over to their Website HERE). We were recommended this place by family and headed over 8.30am mid-week to see what the fuss was about. 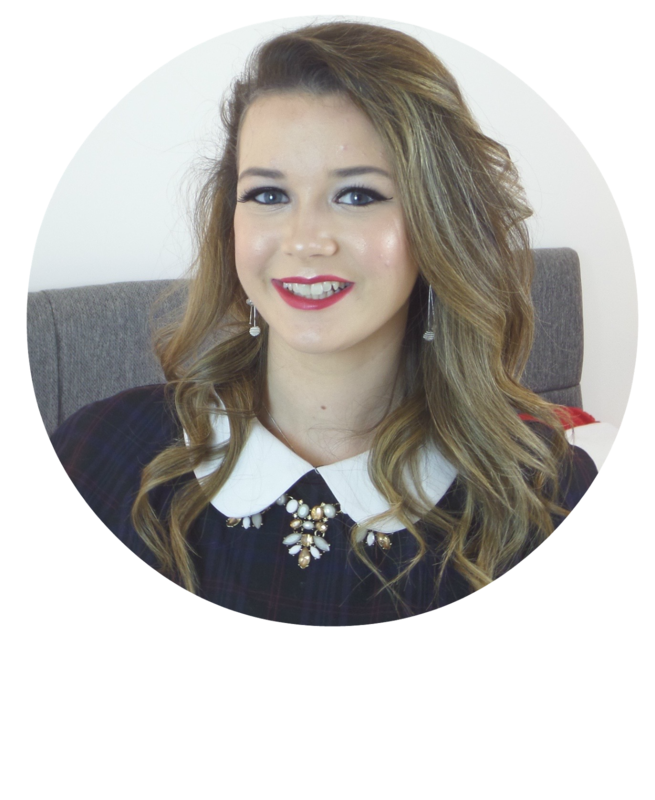 We had tried to get a table around 10am at the weekend, but there were none available, so would recommend booking if that is the time you wish to eat. We were shown to a lovely table by the window with nice views over the beach, and there was plenty of outdoor seating available (it was just a tad hot for us!). The waitress was smily, super nice and polite. The menu was huge, but split up into sections to make it slightly easier. To drink I ordered the ‘Tropical Teaser’ a blend of mango, banana, pineapple and orange which was refreshing and felt healthy, Jack ordered the ‘Honey Blue’ a mix of blueberries, banana, honey and yogurt and was just as delicious. It took us a little while to decide what we wanted to eat but as soon as we were ready the waitress was there and willing to take out order. Jack decided on the ‘Southwest Sunrise’ an omelette with cheese, peppers and avocado and served with lyonnaise style potatoes. 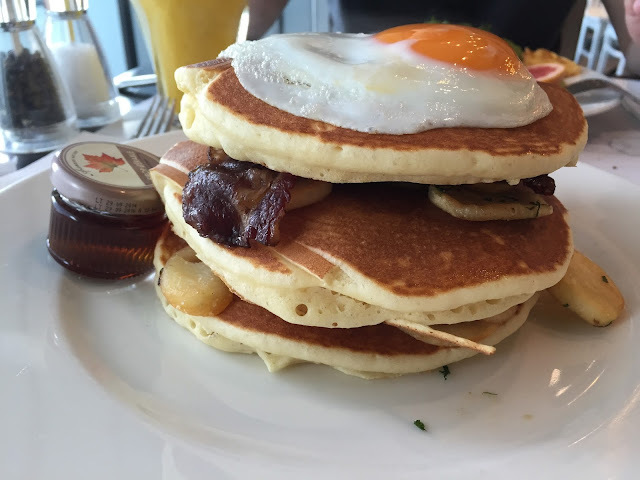 I on the other hand, have trouble deciding on the sweet or savoury breakfast option so decided to combine the two and enjoy the ‘High Rise Pancakes’ which consisted of a stack of pancakes with sausage, beef bacon (not much pork in Dubai), and potatoes layered between and topped off with a fried egg. Both meals were delicious and there was plenty to eat for all, the bill came quickly upon request and overall was reasonably priced 184 AED (£33). The restaurant is in a beautiful location and really worth a visit. We enjoyed it so much we went back on our last morning for another delicious breakfast. Now we are back in London we would love some weekend breakfast recommendation so make sure you leave your favourite breakfast place in the comments below.